With the grand opening of Trader Joe’s in Hoboken just a few days ago, it’s time to revisit their delicious Curry Chicken Tenders. Their curry chicken tenders are delicious but need some sort of dipping sauce – so why not peanut sauce?! 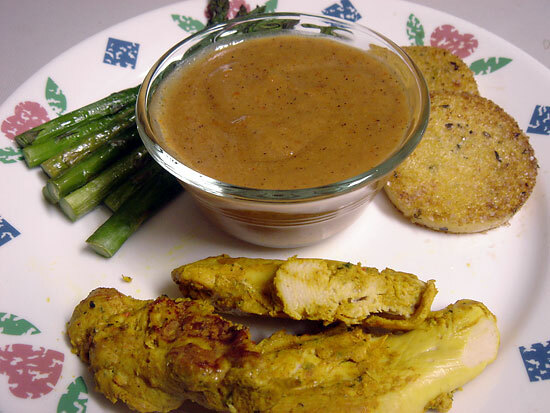 I make a great homemade peanut dipping sauce, but if you’re in a rush then look for the Peanut Sauce Mix by A Taste of Thai. The package has two envelopes so you can make one at a time (although they don’t mention that on the package). Just mix 1 packet with 3/4 cup milk of choice (coconut, almond or dairy all work great). What do you do with the leftover peanut sauce? Drink it! 1. Preheat oven to 375 degrees. Rinse asparagus and dry completely. Coat the asparagus spears with olive oil and garlic salt and place on a baking sheet in one layer. Bake at 375 for about 15-20 minutes, or until very tender. 2. Cook chicken tenders via preferred method. I prefer to grill them. 3. In a small saucepan heat peanut sauce mix, milk, peanut butter and honey (optional) to a boil. Turn down to low and simmer for 5-7 minutes. Turn off heat and let thicken. 4. Place a skillet over medium-high heat and spray with cooking spray or olive oil. Cut polenta into 1/3″ thick slices and place in the skillet. Spray the top of the polenta with cooking spray and sprinkle with salt. Cook about 3-5 minutes per side, or until crispy and browned on both sides. I think I just bought those same chicken tenders last week- i thought they were great! Trader Joe’s never fails… that meal looks very satisfying! What do you think of Whole Foods brand 365 creamy peanut butter? I just bought it for the first time today but haven’t tried it yet. I had that sauce for dinner on my tofu pad thai. Have had it a bunch of times actually in the past. I agree…it’s very good! I’m going to copy the dunking idea for next time. cassie, TJ’s has never let me down! I don’t believe I’ve had the 365 brand of peanut butter. I did get the Wild Oats brand from Whole Foods and it was so cheap that I thought it was maybe a second “Whole Foods brand” of peanut butter. Either way the Wild Oats brand was very good. It wasn’t very creamy and had a slightly weird flavor. rita, I don’t think there any any Indonesian shops around here. I’ll have to keep my eyes out for an Indonesian peanut sauce. Thanks! veggiegirl, True, you can’t go wrong with Whole Foods and Trader Joe’s! nadia, That sauce mix is the best I’ve found. I tried a premade sauce in a bottle that was terrible and a peanut sauce mix from a different brand which was in between the two. Nothing beats A Taste of Thai though. I used to love Trader Joe’s. Unfor., we no longer live within 50miles of one. Polenta looks yummy! I love that stuff. Have a good day Nick! Looks like a delicious dinner! I really need to find a trader joe’s somewhere. I love Peanut Butter and chicken together. On second thought, I don’t know if there is anything I don’t like Peanut Butter with! Love the blog and recipes!! This looks so good and I’m with you – 14 ingredients for one sauce is just too many! I love chicken with peanut sauce! I miss Trader Joe’s so much! Fortunately I am going back to California in May so I am definately making a trip to TJs! polenta is one of my specialties. once you try it, you’ll never buy the packaged versions again. best of all, it’s super easy to make, and tastes amazing with anything….although it’s not the healthiest of foods. bring water to a boil in large saucepan. add 2 tsp salt. gradually whisk in cornmeal, constantly whisking to avoid clumping. add cream and cheese, continue whisking, then reduce heat to low. add pepper. let cook 3-5 mins, constantly stirring. b., I’ve only had polenta that one time, but I think I would definitely make it myself next time. Your recipe sounds great, I love fresh grated parmesan with any starch, it makes it rich and creamy and reminds me of a risotto. To lighten it, maybe you could use low fat milk instead of heavy cream? Then it ain’t so bad at all! Just tried those TJ’s Curry Chicken Tenders… while I love Indian food, I think those tasted like soap!! I also love coriander and cilantro, but I thought these were just terrible! Totally agree… thought they were going to great; but, I was wrong!